Every year when we approach the end of summer and the new school year approaches, I always wish there was a way for us to bottle up all of the fun memories we’ve made so we can look back on them throughout the school year and have something to look forward to. 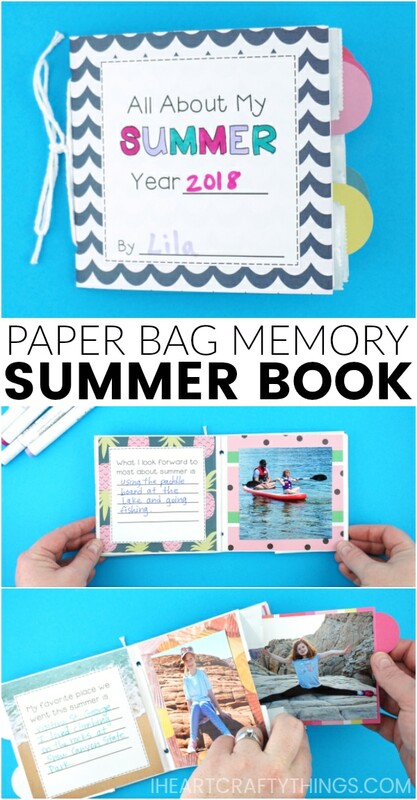 This year I am heading into the summer months extra prepared with our new paper bag summer memory book for kids. It’s a project that kids can start now and have fun working on all summer long as they create new special memories. 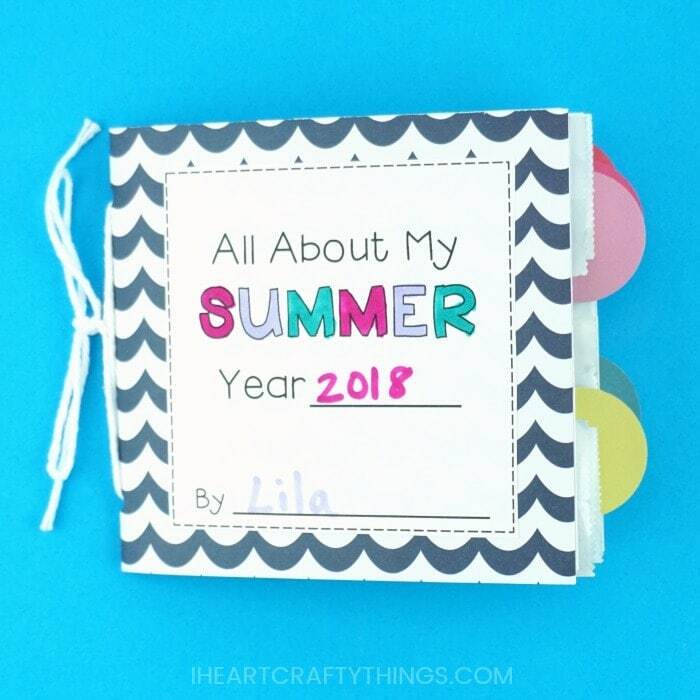 Then when school starts kids will have a keepsake book they can look through whenever they are having a rough day or need a remembrance of sunny, summer days. 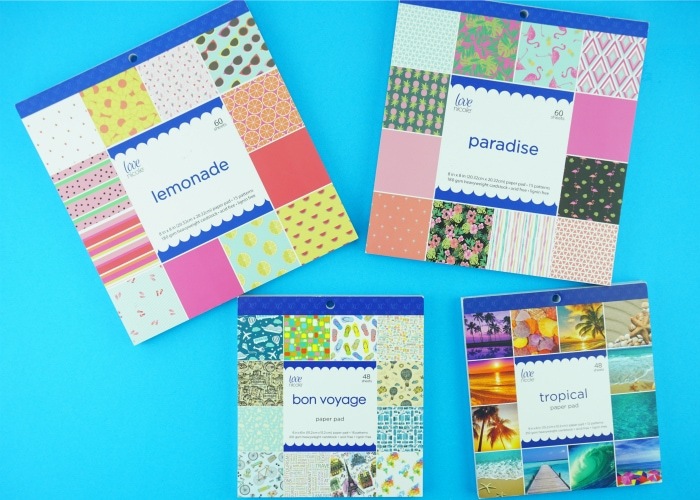 This darling summer memory book craft was inspired when we saw these amazing Love Nicole paper packs that are exclusive at A.C. Moore. 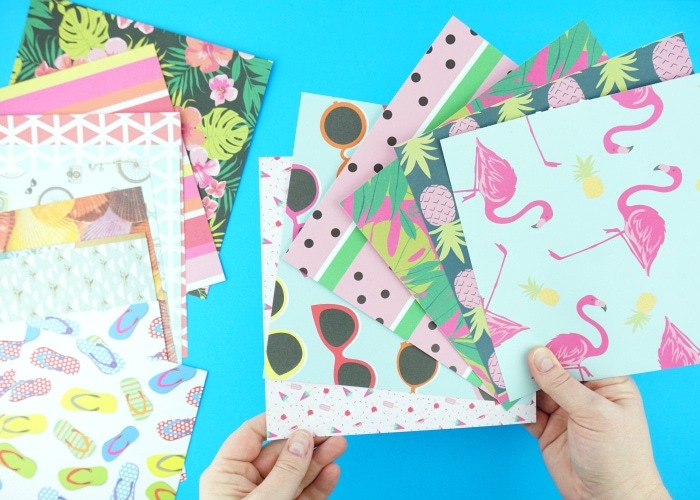 The paper packs reminded me of some of our favorite things about summer…watermelon, pineapple, sunglasses, flip flops, ice cream and the beach. The papers are colorful and thick and I adore how they come in smaller sizes for smaller projects like our summer memory books. 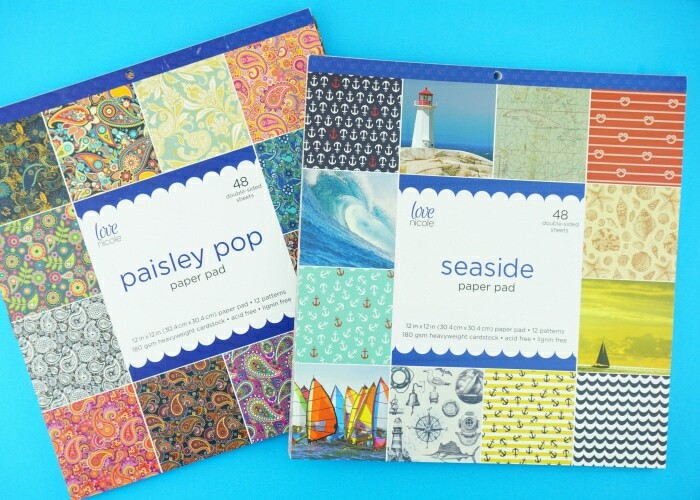 To get started on making your paper bag summer memory book, head to A.C. Moore and grab some of your favorite Love Nicole paper packs. For this project you’ll need a 12×12-inch sheet for your book cover and then any other size paper packs to make your 10 book pages. A.C. Moore recently partnered with Create and Craft to bring you the A.C. Moore Hour, airing every Wednesday at 11AM Eastern time! Each episode will leave you feeling inspired with great craft ideas and you can watch it right in the comfort of your own home on DISH Network or by streaming it online at createandcraft.com (or Roku, Apple TV and Fire TV). Since my daughter and I love crafting together in the summer, I am super excited to watch the show to plan out some new projects for us. 1. Begin by layering three paper bags together. Layer the first bag with the bottom flap facing up. Then layer the next bag with the bottom flap face down and on the opposite end. Layer the third bag like you did the first. 2. 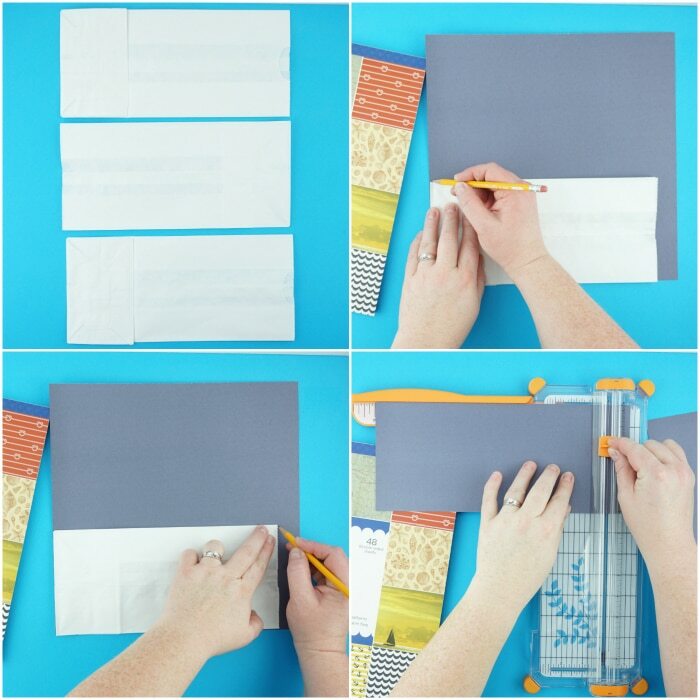 Use a separate paper bag as a template and trace it onto your 12×12-inch scrapbook paper. Use your paper cutter to cut out the rectangle. 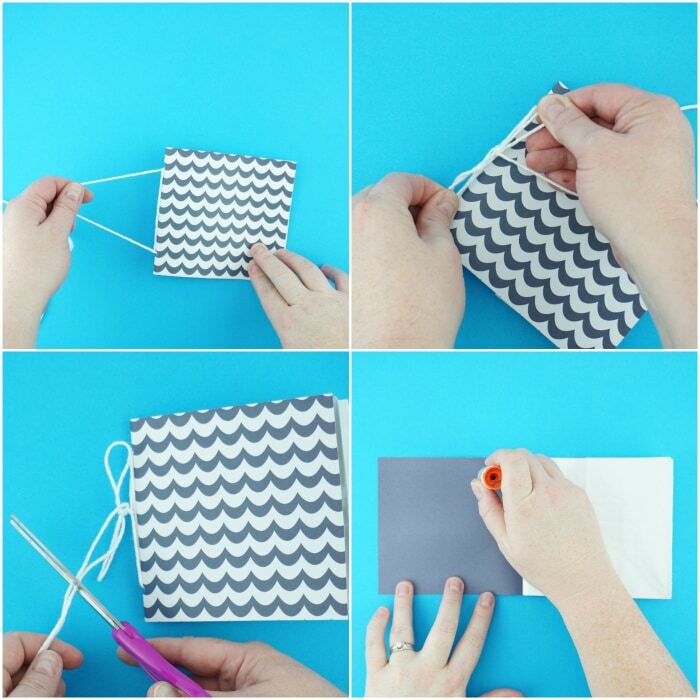 Place the cover at the bottom of the three paper bags, with the pattern side at the bottom to form a book cover. 3. Fold your cover and three paper bags in half. Open the book back up and use your hole punch to punch a hole on each end of the book on the fold line in the middle of the book. 4. Cut off a piece of white string about 2-feet long. Starting on the outside of the book, thread each end of the string down into one of the holes so they come out in the center of the open book. Next thread each string in the opposite hole so both ends come out along the outside seam of the book. 5. Tie a knot in the middle of the seam with the string. Then add a bow with a double knot to secure the book shut. Cut off any excess string. 6. Use your heavy duty glue stick to add glue on the back of the paper cover and glue it down onto the front and back of the paper bag book. 7. Gather your favorite paper from your Love Nicole paper packs and use your paper cutter to cut out ten 5×5-inch square pieces of paper. 8. 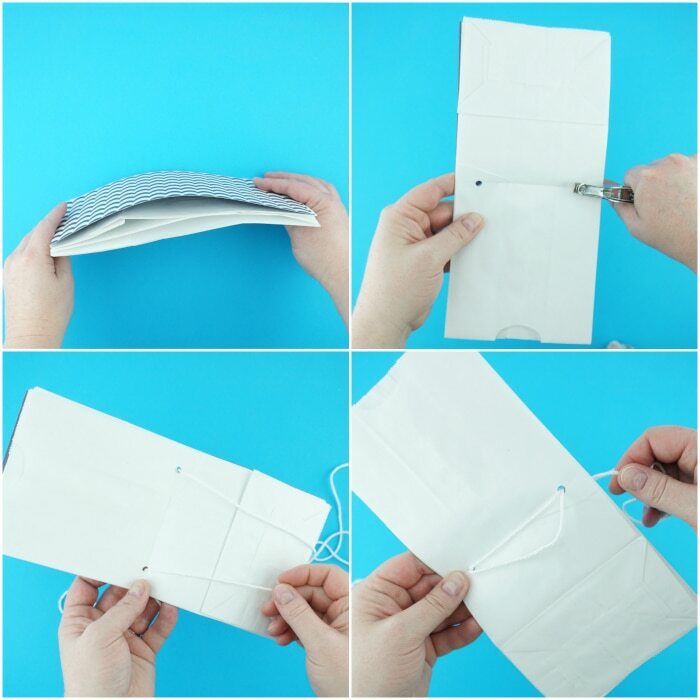 Glue the ten square papers on the inside pages of your paper bag book. 9. Download and print out our summer memory book template. Cut out each of the squares in the template. Have your child use markers or crayons to personalize the pages of the template. If some of the pages don’t apply yet because it is the beginning of summer simply leave them blank to fill in throughout the summer months as you have more memories to write about. 10. 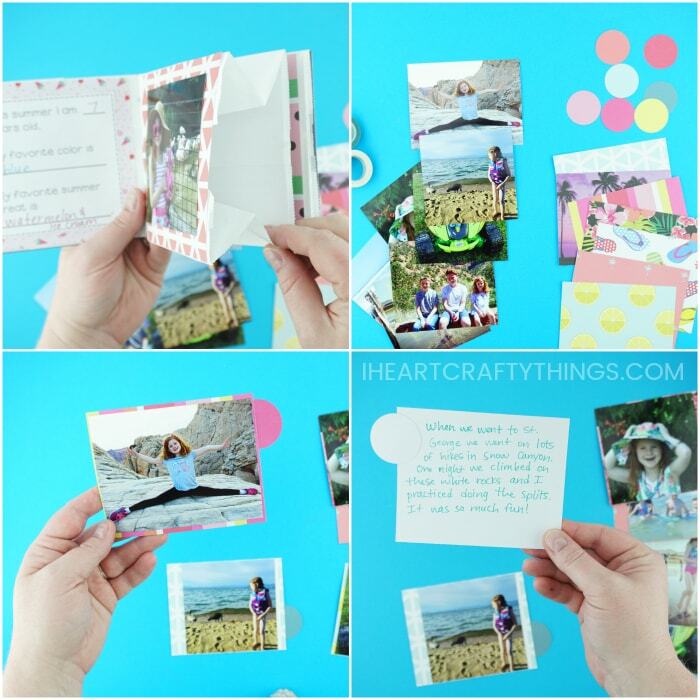 Print out five photos to go along with the pages of your paper bag summer memory book and cut them into 4×4-inch photos. 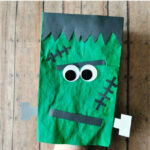 As an alternative you can use white paper and have children draw pictures on them. 11. 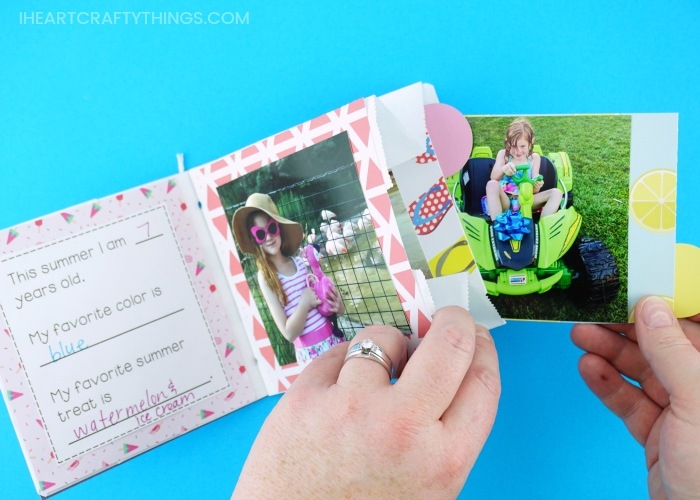 Glue the template pages and pictures on the inside pages of the summer memory book. My favorite part about the paper bag summer memory books is the three open pouches on the inside of the book that you can fill with extra photos. 12. Print out several photos from your favorite summer memories. 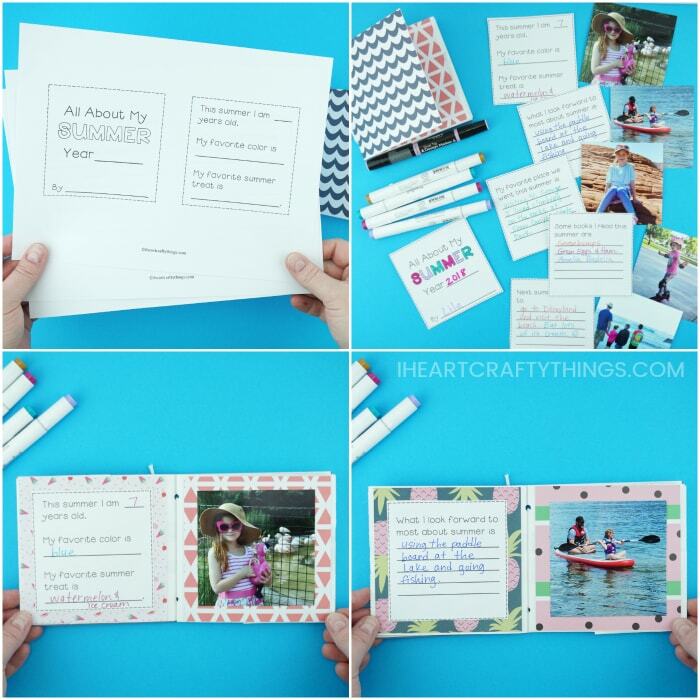 (4×4-inch photos or a 4×6-inch photos cut down to 4×5-inch works best) Once you’ve gathered your photos, use a paper cutter to cut out rectangles from your Love Nicole paper that are 4×5-inches. You will also need to cut out circles from some of the solid color paper sheets that are 1-1/2 inches in diameter. 13. Glue the photos onto the 4×5-inch rectangles. Then glue one half of the circle onto the back of the rectangle so the other half sticks out of the rectangle to create a tab. 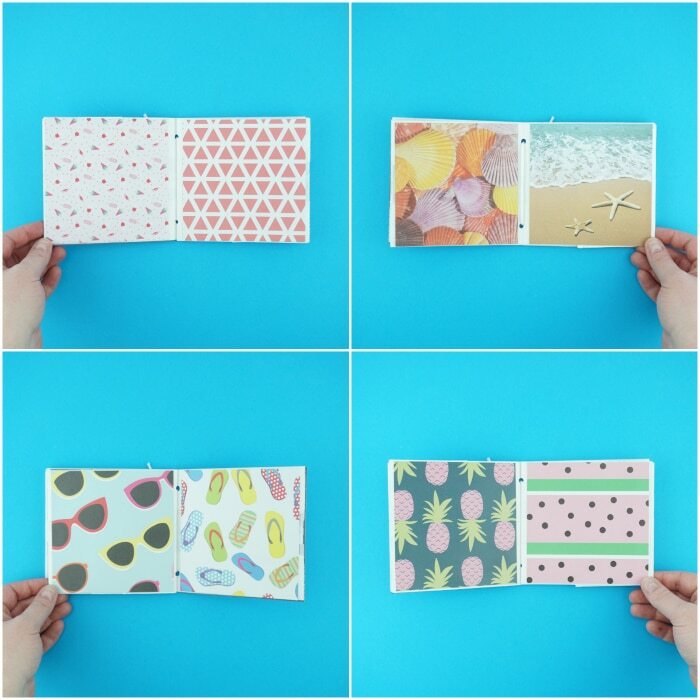 You can stagger the placement of the circles on the photos (top, middle, bottom) so the photos are easier to grip inside the pockets of the summer memory book. For extra fun, write notes on the back of the papers giving more info about the photo or memory pictured. Now place the photos inside the pockets within the summer memory book. 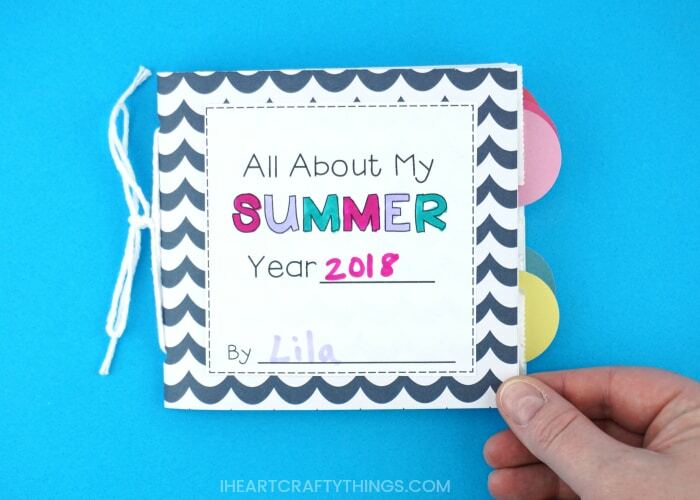 Your paper bag summer memory book is complete! 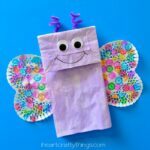 Whether you make the memory book at the end of the summer or work on it throughout the summer months, this fun craft is one that every member of the family can enjoy and cherish for years to come. Learn more about Love Nicole products and get inspiration by visiting A.C. Moore. 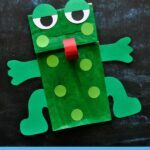 Don’t forget to tune it to the A.C. Moore Hour every Wednesday at 11AM Eastern time for more fun crafty ideas! Wonderful paper bag. Brilliant tutorial.